London - Arsenal manager Arsene Wenger has told Manchester City his club no longer need to sell the likes of Jack Wilshere while warning no player can be assured of first-team action at the north London giants. Reports in the British press have linked England midfielder Wilshere with a move to faltering champions City after the end of the current Premier League season. But Wenger is not in a mood to entertain offers for the 23-year-old, who has been at Arsenal since the age of nine, or indeed anyone else. Instead the second-placed Gunners, who were hampered financially by the cost of the club's move from their former Highbury home to the Emirates Stadium, aim to rid themselves of a reputation for selling key players, such as now Manchester United striker Robin van Persie. 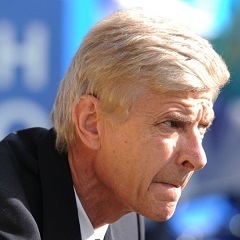 "We are not in a position any more where we have to sell our best players," Wenger said Thursday. "We cannot make a case of any headline in any newspaper in a press conference from things that are not true," the veteran French manager added. Wilshere, long troubled by ankle problems, has recovered from a latest bout of surgery and could make his first appearance since the end of November away to relegation candidates Burnley on Saturday. "Everybody can have a big impact until the end of the season, Jack included," Wenger said. "Every player who doesn't play is very frustrated when he can not perform -- (Abou) Diaby has been out for a year, (Theo) Walcott has been out for a year. "Wilshere has played many games this year, he was out, but not for as long as Walcott or Diaby." Talented playmaker Wilshere appeared in an Arsenal under-21s match against Stoke earlier this week, together with captain Mikel Arteta and midfielder Diaby, who are both on the way back from injuries. Another encouraging sign for Arsenal is the return of full-back Mathieu Debuchy from shoulder surgery. "We are all in a fantastic position, but our job is competing," Wenger said. "You cannot say that you have to accept to compete, if you cannot compete then you have nothing to do in this job." He added: "Everybody is rated exactly the same and you respect everybody and want everybody to just contribute to the team." Defender Laurent Koscielny (groin) and goalkeeper Wojciech Szczesny (rib) face fitness tests ahead of this weekend's trip to take on north-west side Burnley. Arsenal have risen to second place, seven points behind leaders and London rivals Chelsea, who have a game in hand, following a blistering run of form. Last weekend's comprehensive 4-1 win over Liverpool was Arsenal's seventh successive Premier League victory. FA Cup-holders Arsenal also have a semi-final against Reading at Wembley next week to look forward to as they bid to retain the knockout trophy. "The target of the work during the season is that your team becomes stronger and we still have many challenges until the end of the season," said Wenger. "It is interesting that we are in good form and it is interesting that we have a good team dynamic. "Hopefully we can maintain that until the end of the season, then we will see where we stand. "We look behind us and people are chasing us, in front of us there is quite a big distance with Chelsea, but we will work very hard to reduce that."